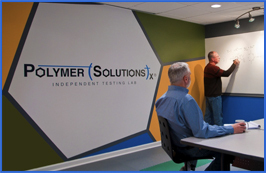 HPLC, or High Performance Liquid Chromatography, has been under constant development since 1960. Initially called High Pressure Liquid Chromatography, it overcame the limitations of gravity-driven liquid chromatography, resulting in better component resolution and allowing faster analysis. These two incentives, resolution and speed, have been driving HPLC development since. HPLC is a type of liquid chromatography with the mobile phase forced through the column by high pressure delivered by a pump. HPLC analysis starts with an injection loop of 5-100 microliters for seamless introduction of a liquid sample into a thin stainless steel column (typically 1-5 mm in diameter and 3-25 cm in length) through vacuum-tight connectors to maintain high pressure through the system. HPLC columns are often temperature-controlled, i.e., they can be either warmed to improve solubility of the compounds or cooled to ensure the stability of certain analytes. The pressure in HPLC reaches 6,000-9,000 psi, with a flow rate of 1-2ml/min. The columns are packed with very small particles of sorbent, or a stationary phase (2-50 micrometers). The particles are porous and/or have a chemically bonded phase that interacts with the sample components to separate them. The mobile phase flowing through the column is usually a mix of several solvents and can be either constant (isocratic) or changing (gradient). The separated components of a sample are detected at the exit of the column using a detecting device, such as a UV/visible, a photodiode array (PDA), a mass spectrometer (MS), evaporative light scattering (ELSD), refractive index (RI), or a fluorescent detector that allows quantitative analysis of the components. The detector output is presented as a graph (chromatogram) on a computer screen or paper strip. 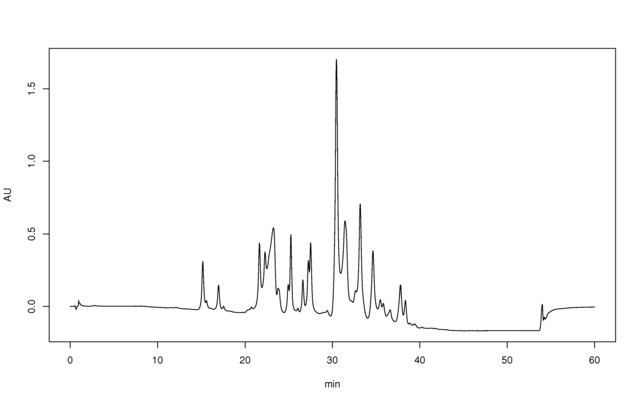 HPLC chromatogram of J’Adore perfume water, as example of complex mixture analysis. Separation on C18 column using almost linear 5-100% acetonitrile-water gradient. Reverse-phase chromatography is the most popular technique among HPLC methods and is used 90% of the time; it is characterized by a nonpolar stationary phase (C18, C8, C3 column) and water-based polar solvent mix. Normal phase HPLC uses a combination of a polar sorbent (like silica gel) and nonpolar solvents such as hexane for its mobile phase; it is used for separation of cis-trans isomers and chiral compounds, which is especially valuable for the pharmaceutical industry. In ion exchange chromatography the stationary phase in the column contains ionic groups, while the mobile phase is an aqueous buffer. This is a popular method to separate ionic compounds, such as dyes and aminoacids. In size exclusion chromatography, the sorbent is inert and porous, and the analyte molecules are separated by their size, with smaller molecules diffusing deeper into the pores and taking the longest to elute. This technique is most popular for polymer characterization. Perhaps the most consistent trend in the development of high-performance liquid chromatography (HPLC) since its inception in the 1960s has been the continuing reach for ever faster analyses […] Certainly the continued development of ultrafast separations will play an important role in the development of two-dimensional HPLC separations. 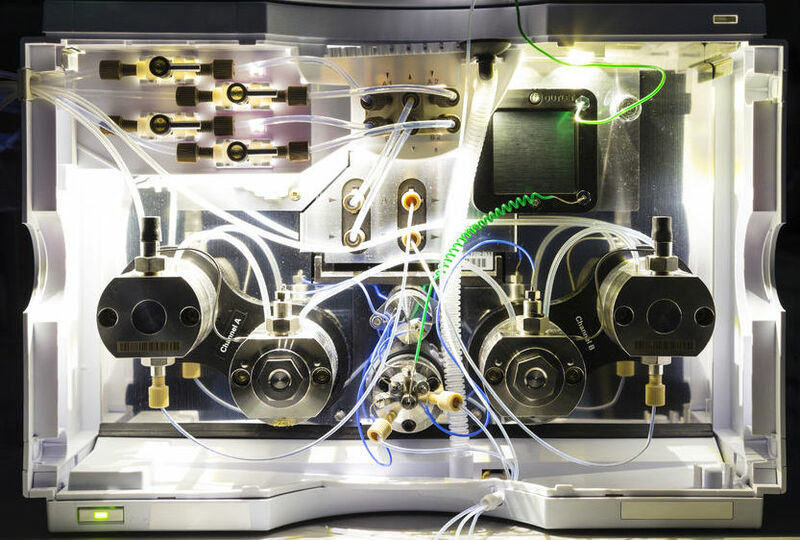 Despite the relatively long history of HPLC as an analytical technique, there is no sign of a slow-down in the development of novel HPLC technologies. Every day, HPLC is applied to chemical analysis, pharmaceutical analysis and food analysis in numerous labs across the world. It is an indispensable tool to detect additives in a variety of polymer products and formulations, and versatile enough to analyze food and beverages. It is used to detect proteins, peptides, amino acids, phospholipids, fat- and water-soluble vitamins, carbohydrates, caffeine, alcohol, organic acids, sweeteners, colorants, preservatives, mycotoxins, herbicides and fungicides, endocrine disruptors, polyaromatic hydrocarbons, synthetic phenolic antioxidants, dioxins, and polychlorinated bisphenyls (PCBs). From identifying a unique aroma to a detecting a pesticide, you can count on HPLC. Source: “HPLC Basics. Fundamentals of Liquid Chromatography (HPLC).” Courtesy of Agilent Technologies (pdf), Inc., polymer.ustc.edu.cn. Source: “Perspectives on Recent Advances in the Speed of High-Performance Liquid Chromatography,” by Peter W. Carr, Dwight R. Stoll, and Xiaoli Wang, Analytical Chemistry, 2011, 83 (6), pp 1890–1900; DOI: 10.1021/ac102570t. Source: Food Analysis by HPLC, Third Edition, by CRC Press, editors Leo M.L. Nollet and Fidel Toldra, November 16, 2012. Video: “High Performance Liquid Chromatography HPLC,” by Royal Society of Chemistry, YouTube.